Everybody in the world knows we are in a global financial crisis like never before. Many in the world are looking to America for strength and solutions. And as of this morning people are looking to Barack Obama. And the American people have given Barack Obama a mandate to solve the problem. There will be no national security without a strong American economy. No social security. No health care. A news story yesterday said the only segments of the California economy showing “growth” were in the sectors of government and medical services. That won’t produce “wealth” for future investment…. If we all believe in the American System of Government, and I sure do, why are we not tasking Congress to create solutions? After the stimulus is passed, where is “Plan B”? Why aren’t Nancy Pelosi and Harry Reid being asked to shut down all the small talk and crap and hold hearings that will give the experts of the world a chance to give the Congress new ideas? Time to end politics as usual…. Experts around tables in the White House are great and we all applaud “Blue Ribbon” committees; but where is our use of our time-tested system? Time to make it work for us…. 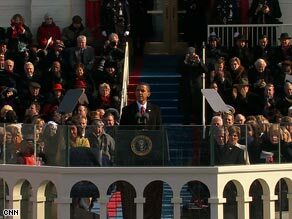 President Obama renewed his call for a massive plan to stimulate economic growth. You are currently browsing the archives for the Powell category.